TOP ROW: Jarred A. Parton, Mary Jaylin Craig, Brandon B. Jacobs, Chelsie S. Harden and David “Bub” Hadley. BOTTOM ROW: William “Corey” King, William Jacob Lustig, William J. Stillabower and Matthew S. Mowery. 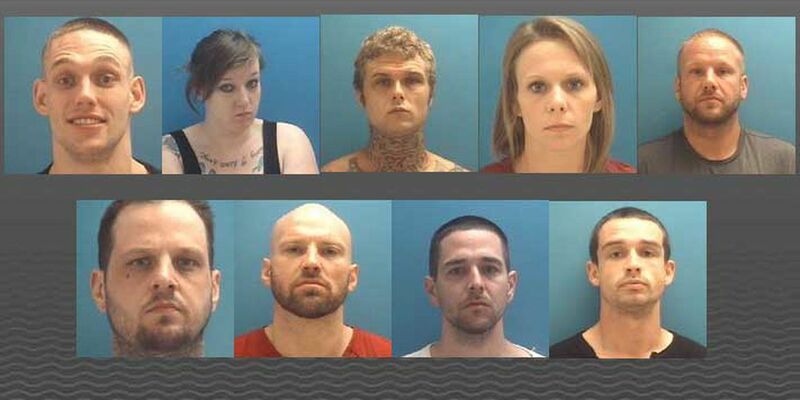 COLUMBUS, IN (WAVE) - Police in Bartholomew County, Indiana have arrested nine people involved in the Aryan Brotherhood after a year-long investigation following the arrests of two others connected to the gang. Columbus police and the Bartholomew County Sheriff's Department say the lengthy investigation began after the original arrests in October 2017. It focused on complaints of narcotics dealing, multiple burglaries and vehicle thefts but also involved attempts to get contraband into the Bartholomew County Jail. Each was booked into the Bartholomew County Jail. The charges range from criminal gang activity to drug trafficking and possession.